0xFF000000 and 0xFF800000 are the same flash offset and thus contain the same data. Only 128MB on this camera?! What are the grey blocks at the start of all these graphs? 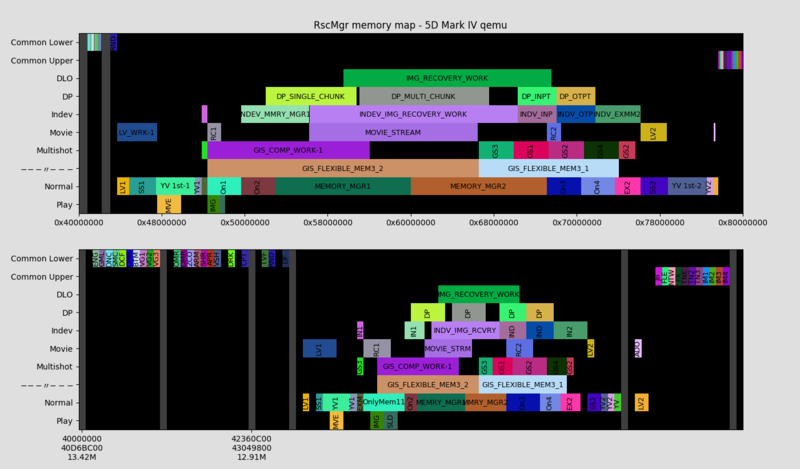 That's where DryOS runs, followed by AllocateMemory. 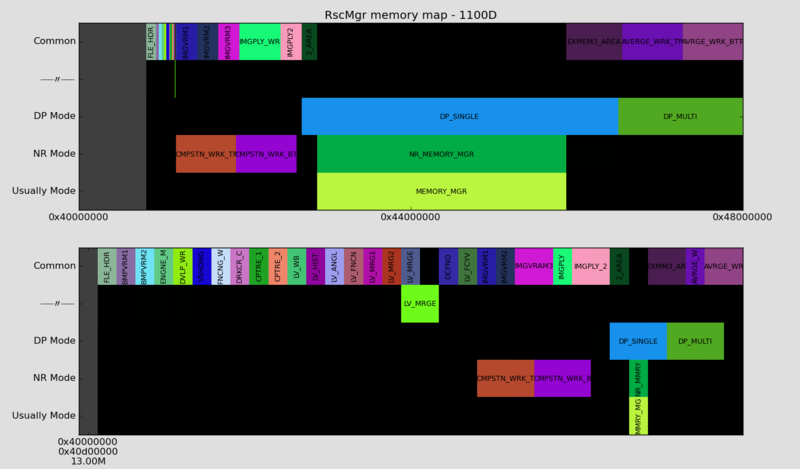 AllocateMemory on 1100D (and others) is from 0x3d0000 to 0xd00000. On 5D3 it's from 0x44C000 to 0xD3C000. You can get more info about this block with meminfo and memmap from drysh. Wait does this mean you could possibly run ML without a card? How exactly did you reach this conclusion? Maybe @hjfilmspeed thinks you can just upload ML there in memory, but that's volatile IIRC, right? 256MB. 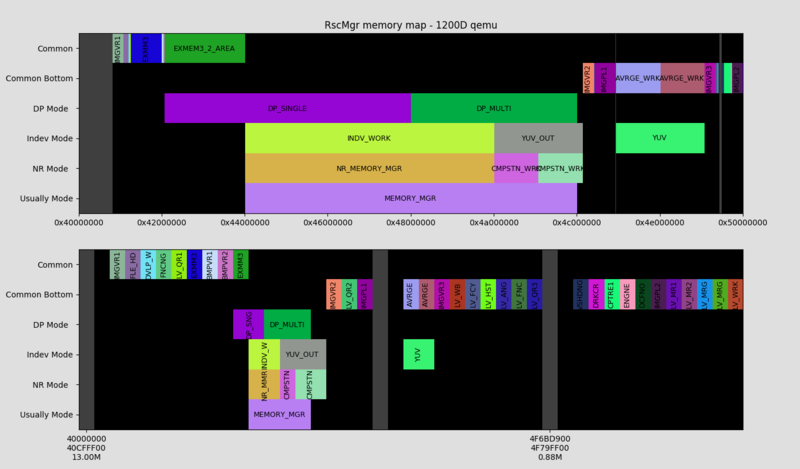 Note the WORK region has invalid size (it would overflow), so I've patched it to get a proper graph. No unused areas for us. Another 256MB cam. 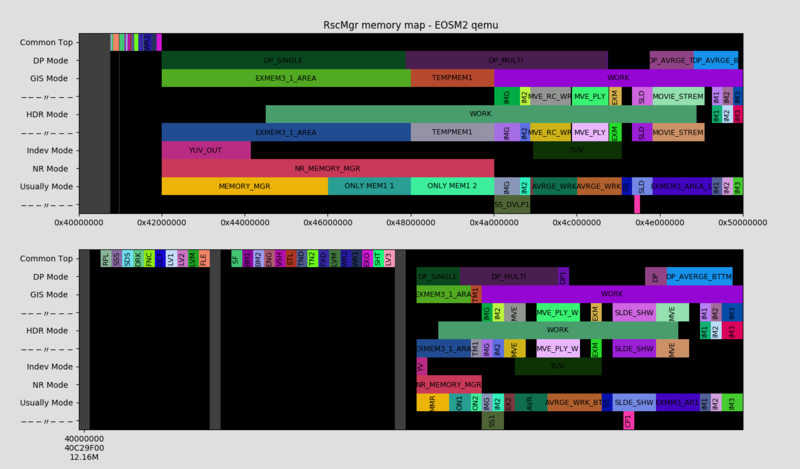 There is a gap between LV_QUARK1 and EXMEM3 that might be useful. 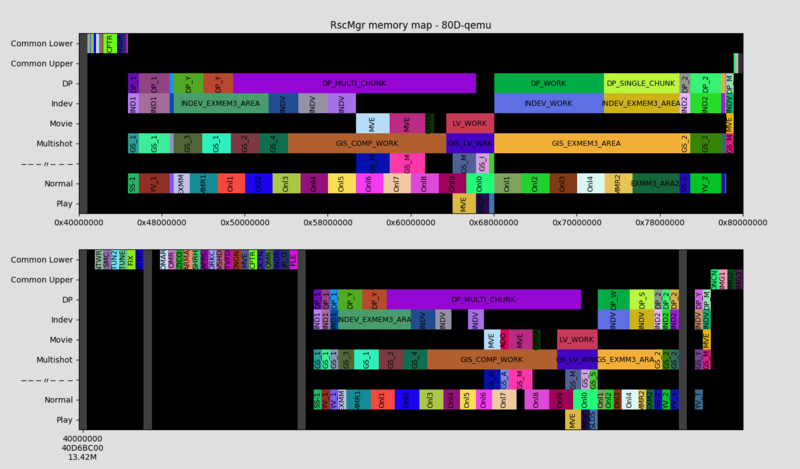 1 GB RAM (on main core). Possibly unused block at 41DE3400 - 41FFFC00 (2.11 MB). 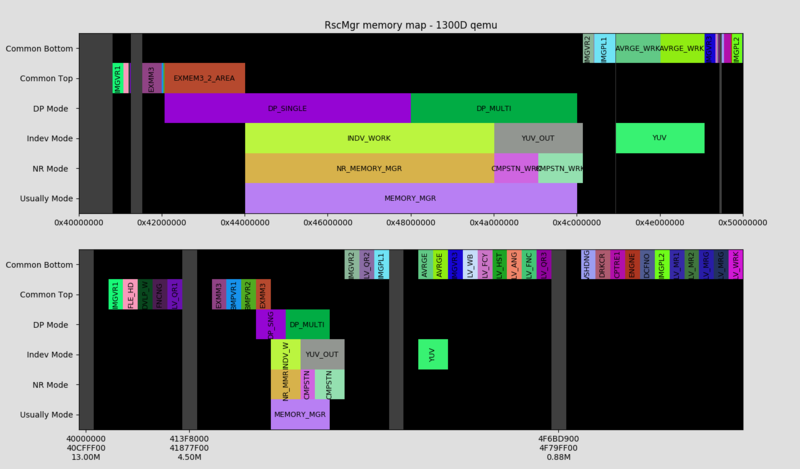 The ENGINE_MIRROR region from the above logs is used by engio_read / EngDrvOut to store the values written to hardware registers, as these registers cannot be read back. This address must be aligned at 0x40000 bytes, but the block allocated for it might be a bit larger. Actual mirror address is 0x5c880000 (rounded up near 0xff1c566c), used until 0x5c8c0000. 0x5c880000 - 0x5C849960 = 217K free before this block. 0x5C849960 + 0x00080000 - 0x5c8c0000 = 38K free after this block. Actual mirror address is 0x41000000 (rounded up near 0xff1d4890), used until 0x41040000. 0x41000000 - 0x40FF7000 = 36K free before this block. 0x40FF7000 + 0x00080000 - 0x41040000 = 225K free after this block. Not bad! The above is just theory; I did not verify whether the addresses are really unused or not. Procedure: CONFIG_MARK_UNUSED_MEMORY_AT_STARTUP, then use the camera in any mode you may think of, including taking pictures in burst mode until the buffer gets full, then look for changes in the tested memory region. See also PR #731. You mean someone else? Looking up the addresses for the other cameras the EOSM2 should be rounding up near ff2c6bf8 but the code looks quite a bit different. So the rounding up isn't happening? 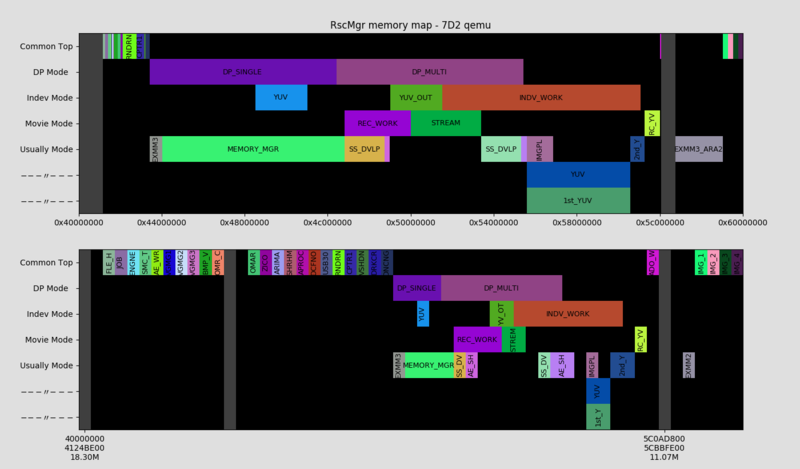 Looked up PR #731 and it seems like the EOSM2 needs to sprout yet another branch--RscMgr_memory, right? 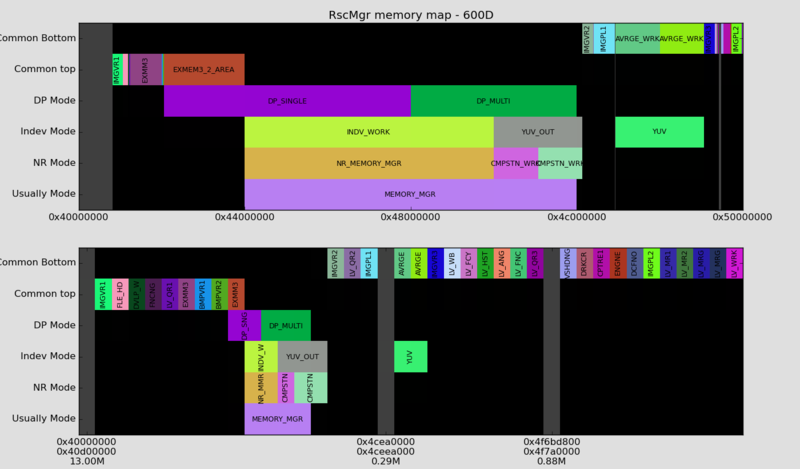 The models that would benefit even from this - small - extra memory are 1100D and 600D. This is the only part I understand in this topic, so my question is : how much is for 600D? (it is not mentioned) in wich these benefits would consist? 600D is linked earlier (you can do the math). 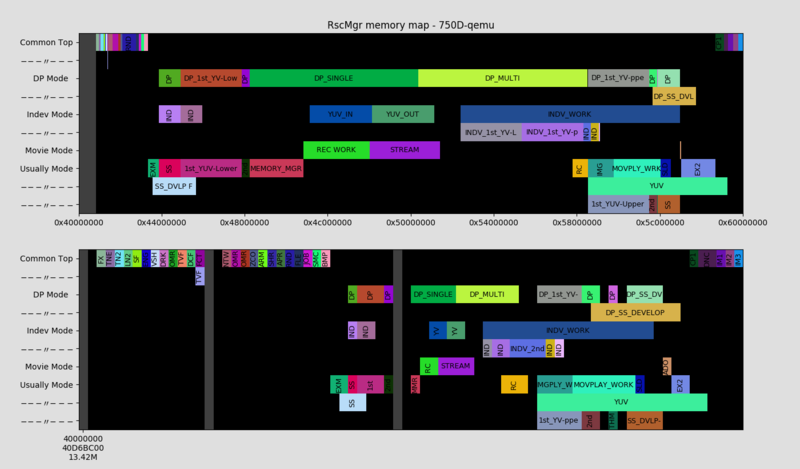 In some cases, ML runs out of general-purpose memory and allocates from shoot_malloc (Debug -> Free Memory); whenever such memory is used for a longer time (such as, many/large modules loaded), certain operations in Canon menu can not be performed (such as switching some ISO options, or developing raw photos in camera, maybe others) and will result in ERR70. You can tell exactly what these situations are. 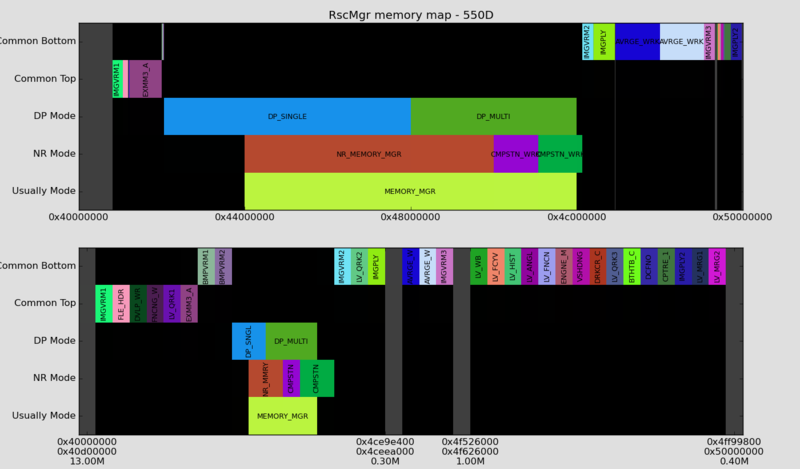 Having 256K of additional memory could make the difference between having to use shoot_malloc (with the problems it has) or not. The issue is probably subtle enough that nobody would ever bother narrowing it down to report it (they would probably just reset ML to defaults). Loading Lua alongside with a few other modules will result in shoot_malloc being used. Try changing everything you can think of in Canon menu in this configuration, and I'm sure you'll find more issues, not just the ones I know about.